Friendship is a bond that develops between like-minded individuals. I have friends, good friends on whom I can depend on in fact they are like family to me. I have lived a nomads life all the time so I have lost all the friends that I have made in childhood its only now thanks to face book that I have started talking to all old friends! When I started making friends with people online I was thrilled but slowly the bond has grown and now the blogging marathon members are also my family. We hare from different places but all of us are attached to a common thread cooking. That is our passion!! Cooking is fun especially when you are cooking with a friend. Yes I am referring to the time when Vaishali visited. She brought us Lotus stems also known as Nadru. She made these delicious fitters!! Awesome that was the verdict at home!! But wai,t I want to bore you up a bit I have researched so much… don’t worry I will give you a watered down version as you are not coming for a history & geography lesson with a garnish of civics like my daughter has pointed out! Kashmir is the north-western region of the Indian subcontinent. In the first half of the 1st millennium, the Kashmir region became an important centre of Hinduism and later of Buddhism; later still, in the ninth century, Kashmir Shaivism arose. The word Kashmir is derived from Sanskrit कश्मीर (káśmīra). The Buddhist Mauryan emperor Ashoka is often credited with having founded the old capital of Kashmir, Shrinagari, now ruins on the outskirts of modern Srinagar. Kashmir was long to be a stronghold of Buddhism and a Buddhist seat of learning. In 1349, Shah Mir became the first Muslim ruler of Kashmir, inaugurating the Salatin-i-Kashmiror Swati dynasty. For the next five centuries, Muslim monarchs ruled Kashmir, including the Mughals, who ruled from 1526 until 1751, and the Afghan Durrani Empire, which ruled from 1747 until 1820. That year, the Sikhs, under Ranjit Singh, annexed Kashmir. In 1846, after the Sikh defeat in the First Anglo-Sikh War, and upon the purchase of the region from the British under the Treaty of Amritsar, the Raja of Jammu, Gulab Singh, became the new ruler of Kashmir. The rule of his descendants, under the paramountcy (or tutelage) of the British Crown, lasted until 1947. But me a foodie I am interested in Food! Kashmiri cuisine includes dum aloo (boiled potatoes with heavy amounts of spice), tzaman (a solid cottage cheese), rogan josh (lamb cooked in heavy spices), yakhiyn (lamb cooked in curd with mild spices), hakh (a spinach-like leaf), rista-gushtaba (minced meat balls in tomato and curd curry), danival korme, and the signature rice which is particular to Asian cultures. The traditional wazwan feast involves cooking meat or vegetables, usually mutton, in several different ways. Alcohol is strictly prohibited in most places. There are two styles of making tea in the region: Noon Chai, or salt tea, which is pink in colour (known as chinen posh rang or peach flower colour) and popular with locals; andkahwah, a tea for festive occasions, made with saffron and spices (cardamom, cinnamon, sugar, noon chai leaves), and black tea. But Nadru Monje is a snack from Kashmir, made from lotus stems. It is a popular street snack of Kashmir Valley. Cut the stems into three big pieces. With the help of a knife make slices of the stems. We made long slices. 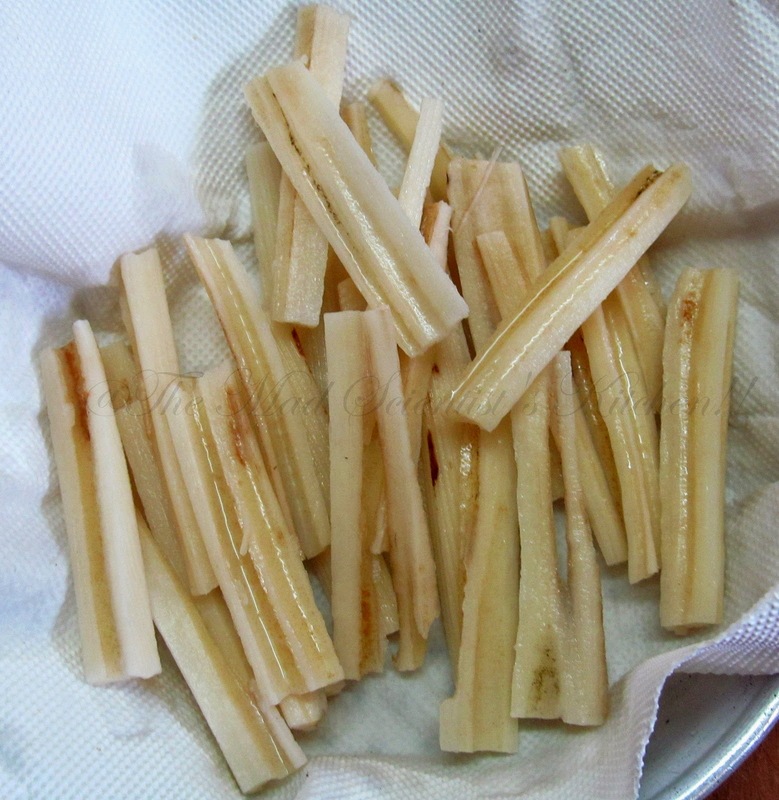 Place the chopped stems in a bowl. Add salt, red chili powder, cumin seeds rice flour. Mix well. Add water to the mixture little at a time. Mix well all the ingredients together, until all of the stems are coated with the rice flour batter. Pour oil into a kadhai/wok. Place it on a gas stove and switch it on to heat the oil. Immerse the battered lotus pieces in the oil to deep fry. Use tongs or a slotted spoon. Keep moving the pieces from one side to the other so that they do not burn. Take the fritters out. Once the fritters acquire the desired reddish color and have a crispy texture, remove them from the oil. Place the fritters on a piece of kitchen paper towel or piece of newspaper to remove the excess oil. Traditionally the lotus stem fritters with Kashmiri onion chutney or tomato sauce. Lotus stem fritters look crispy & crunchy. Nice teatime snack. Friendship surely is a beautiful bond..and I guess all of us at BM have a bond which is difficult to build.Three cheers! !..and ya those FRITTERS ACTUALLY TASTED YUM..NICE AND SPICY!! so much of detail about J&K... wow.. very well written.. this fritters are so delicious.. They look nice and crispy. You sure had a good time when Vaishali visited. Those fritters are asking me to munch some, crunchy and very crispy. Yummy crunchy munchy fritters..Looks great..
Can never agree more than what you said about friends..especially Vaishali, she's got in an entirely new meaning..so lovely to know that she got this for you..eheheh..yea yea read all your history notes..:)..nice fritters.. Irresistible fritters, Archana. I wonder if we get lotus stem also here. That seriously sounds like an addictive snack. Looks yummy! !